This unusual name is of German origin and is first recorded in England in the early 18th Century (see below) in the form of "Hubner". There are a number of recorded variants of the name, ranging from "Huebner" and "Hubner" to "Hebner" and "Hibner". The name means an agricultural worker, a farmer, possibly and specifically one who worked a "hube", which was a piece of land roughly equivalent to the English measurement of a "hide", about 120 acres. The surname referred most often to a feudal tenant in Medieval Germany. 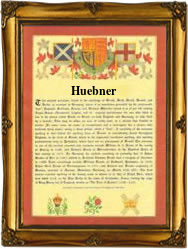 As "Hubner" the name is recorded heraldically in seven of the former principalities of Germany and in Austria. One John Hebner was christened on the 2nd April 1658 at St. Mary's, Whitechapel, London. The first recorded spelling of the family name is shown to be that of Benjamin Hubner, christned, which was dated 15th September 1728, at St. Mary's, Marylebone, London, during the reign of King George II, known as the Last Warrior King, 1727 - 1760. Surnames became necessary when governments introduced personal taxation. In England this was known as Poll Tax. Throughout the centuries, surnames in every country have continued to "develop" often leading to astonishing variants of the original spelling.